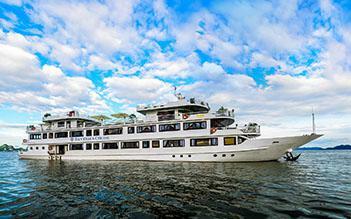 Let’s get Huong Hai Sealife Halong bay cruise for a true experience. In order to bring the most convenient and fantastic trip, all of our services from the dining room, guest rooms, bars, sundeck, massage rooms and many other recreational facilities are at the highest level of luxury and offered by all friendly, well-trained crew. Visit Vung Vieng pearl-growing and fishing village. Meet and explore local life. Explore Thien Canh Son Cave and enjoy swimming, relaxing on the beach. Have to say that the trip left some memorable moments, e.g. kayaking around one of the islets, mimicking taichi moves demonstrated by the masterful staff (who did it like a master) while having the viet sunrise warming up your back & surrounded by the islets. Good trip and have to say good food as well. However, personally believe the dinner (2D1N) can be improved upon; it is a little too fusion-ish (asian + western) and did not have a strong theme and thus lose its chance to impress cruise-goers of both asian and western decent. Besides that, I don't mind going on this cruise with Huong Hai again. The boat, rooms and staff were amazing. Very classy and well maintained. Food was great although it leans heavily toward sea food. If you don’t fancy sea food you may want to register as a vegetarian. Only beef is that the activities are tame. May not be your boat if you like to live a little closer to the edge. 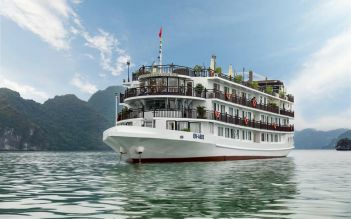 Went for a 2 day 1 night cruise in early September and booked through our hotel in Hanoi. 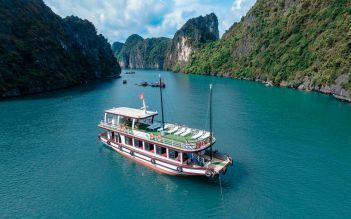 There are plenty of cruise options but we decided to choose Huong Hai as it goes to Bai Tu Long - which has 40% or less of the tourist footfall of the "standard" Halong Bay route (around Cat Ba or even up to Lan Ha Bay). The area was indeed rather quiet and we saw only a couple of other boats cruising the same route. All boats (regardless of operator) can only cruise/dock in pre-approved routes and no deviations are allowed. There is also little variation on activities and destinations on each route among the operators so it really boils down to the attributes of the boat, the facilities/rooms, the service staff and the food. The boat itself isn't the newest or swankiest. It has little frills but the dining and communal areas are very clean and decorated with plenty of traditional wood and Vietnamese curios The sundeck area was very large and there were enough sun beds to go around, although the bar was rather spartan. All cabin rooms come with sea views and their own private (and sheltered) balcony. The room and en-suite bathroom were decently sized and very clean - slippers are also provided for your use. Aircon was strong but there were no channels on the TV. Most of the guests on our cruise appeared to travelling independently and the mix of nationalities was impressively diverse. Including us, there were 38 guests in total which I believe was close to the maximum capacity of the boat we were in. There were couples and friends whose ages ranged from the early 20s up to the 60s. Food was pretty good but not particularly mind-blowing compared to what you can find in Hanoi or the countryside. Ingredients were fresh, execution was competent and presentation could not be faulted for effort. The staff is attentive, friendly and they work really hard and tirelessly. Kudos to Viet and Lee who were super enthusiastic and energetic and really went out of their way to ensure that guests were well taken care of. Please ask the number of turn-arounds they have to do and the number of rest days they have in a month. It is shocking but I understand from my Vietnamese friend working in the tourist industry that this is common at any level. We were given an overview of the cruise programme and activities twice, after getting on board and during dinner. Briefings were succinct and informative. Organization of the program/activities was well-run and efficient. They certainly run a tight ship (pardon the pun =p). We enjoyed the kayaking and visit to the fishing village. Overall, we would recommend this operator and we feel that it offers great value at this price range. This was probably one of the biggest boats cruising around Halong Bay. The service and staff were amazing and tended to everyone’s needs. You can’t go past the variety of food that was served and they catered to individual dietary requirements. The rooms were spotless and spacious. Small touches like a rose on the bed made it feel special. The sights of Halong Bay are amazing. We were taken to a cave and fishing village all under the expert eyes of Jackie. We also kayaked around the bay, took part in a cooking demonstration and enjoyed happy hour as the sun set. There’s lots of competition for cruises but from my experience you can’t go past this company. This was an excellent experience. Starting with pickup from our hotel we travelled to Ha Long Bay in comfort in a luxury vehicle, sharing with 2 couples (lovely people). On arrival at our destination we were greeted by our Cruise Director Jacky. He quickly filled us in, gave us our room number and tagged our luggage ready for boarding. On arriving on the boat, friendly smiles greeted us from the staff offering a welcome drink. 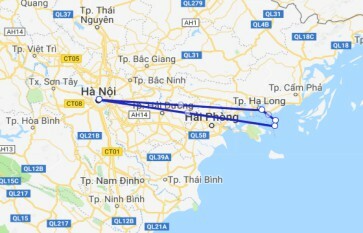 We were all advised the itinerary by Jacky. He is personable and witty. The whole experience was great. The suite we had was wonderful, large windows to see out of and a balcony. The bed was very comfy, great to see when most mattresses in Vietnam are hard. We had glorious weather on Day 1, sunshine and no rain. We enjoyed walking on the white sand beach of Hon Co Island and waded in the water. No swimming is allowed anymore. The cave is nice to visit as well. A special mention to Viet who looked after us during the kayaking (included in our package) & for being a personal photographer to us 4 Aussies. This was alot of fun. Viet also undertook the cooking demonstration, did an awesome job and his talents are amazing. The food during the cruise was excellent, catering both Asian & Western. The light hearted entertainment provided by the crew after dinner was delightful. All the crew are willing to please. Our 2nd day we had a shower of rain however all good. We visited a floating fishing village, boarded a boat where a local villager rowed several of us around the bay. This was very serene and the photo opportunities were brilliant. We enjoyed every minute. We returned back to our hotel in Hanoi in comfort once again. Highly recommend Huong Hai Sealife, you rock.